It’s go time for Dave and the gang!! The day started off early this morning with last minute preps, and then headed into Whitehorse for the start of the race. All 9 dogs where eager to go and more than ready in the chute! I even noticed watching it live from Fairbanks, Woody (lead dog) turned around and gave Frasier an ear full! Maybe it was a pep talk! Doc was also in lead, with Frasier and Norm inswing. Polar was the only wheel dog and was chattering away, lound and clear, ready to go!! The take off looked nice and smooth for them all. The tracker is keeping Dave up to date, and by the looks of it, the dogs are moving quick and steady! Dave is right up there in the pack. I’m thinking they should be arriving in Braeburn before midnight. The gang will most likely get in the truck right away and head out to Carmacks. 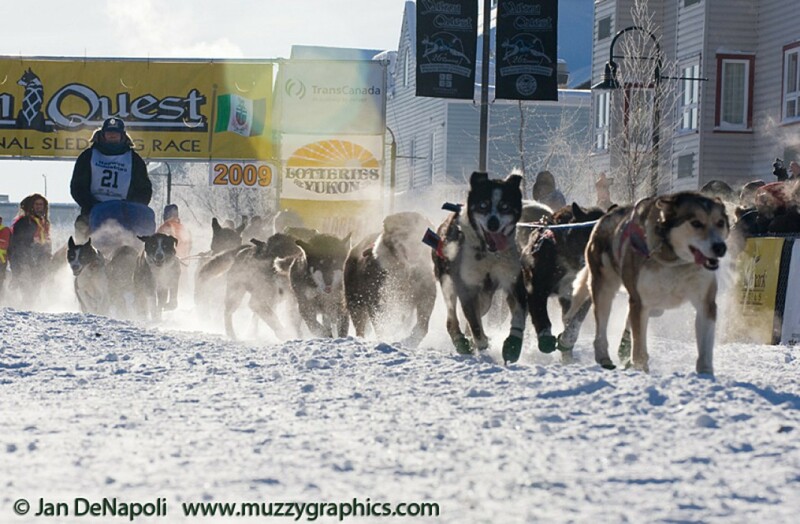 Definitely a little different this year; Safety of the dogs and mushers due to trail conditions and lack of snow. I’m pretty sure Daves handlers will be orderibg him a juicy cheeseburger and fries, so he has a good meal in the truck on the way to Carmacks. 🐶 Dave, his rider Rhonda in the bag, and handler Veronica on the sled.